Overview: A real sizzler of a 5 reel, 9 pay-line video slot, the Wild, Scatter and double-your-money Gamble features on this enthralling game have been enhanced even further with the addition of a Free Spins reward that gives players 15 free spins in which wins are tripled. 3, 4 or 5 Scatters across the reels trigger the Free Spin feature, whilst the appearance of the Wild icon gives players the opportunity to not only complete a winning combination, but double the value of the win. And talking of doubling, there's a chance to do exactly that on the Gamble feature where by choosing color or suit correctly the win can be boosted to a maximum of 10,000.00. 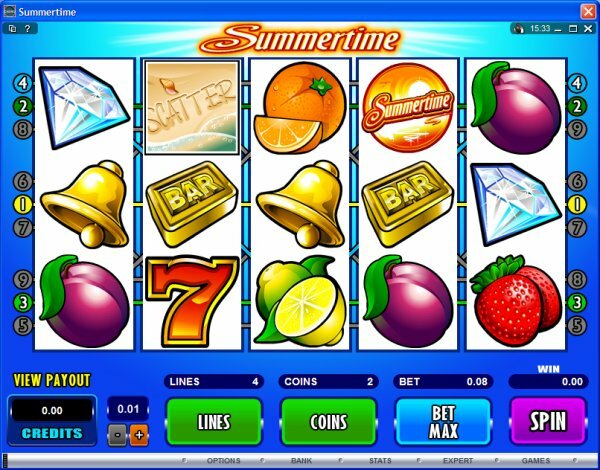 This is definitely a sunshine game where gamblers can win 50,000 coins in the base game jackpot, and three times that with the help and good fortune of those generous Free Spins. 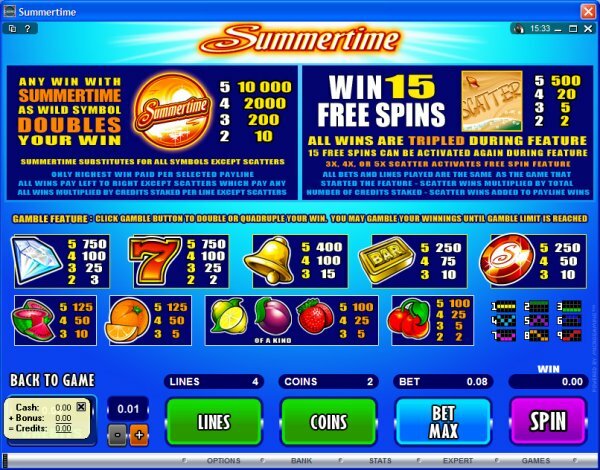 With a wide betting range to suit all pockets and appetites, Summertime is set to provide hours of entertaining fun on those long summer evenings. 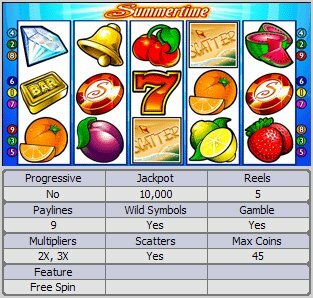 Similar Slots: If you like Summertime, you might like these other 5-reel slot machines: Crazy 80s, Ho Ho Ho, Monster Mania, Sunset Showdown, Twister, Voila.